Is your Mum done with you trying to be Beyonce (or Sam Smith) by belting out If I Were A Boy in the shower? Is your sibling done with your multiple attempts or perfecting the verses of Rap God? Mine are, and I’m pretty sure I’m quite close to being kicked out of the house soon. If you can empathise with me then you’ve come to the right place. 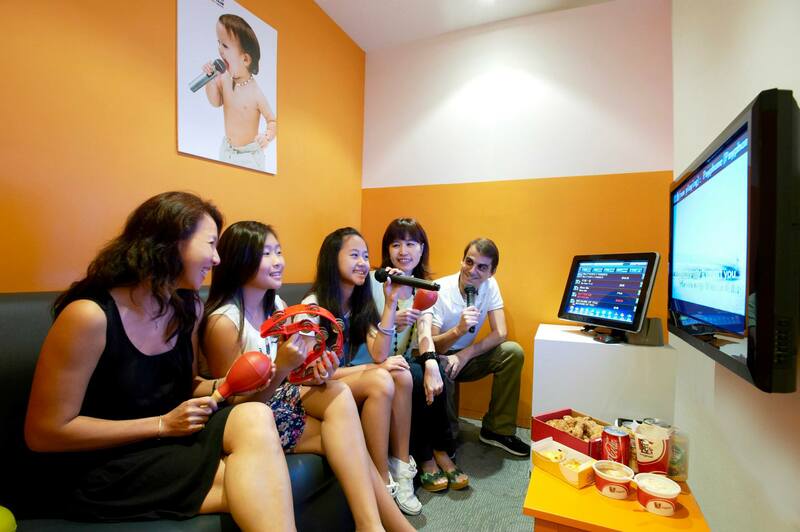 We have here a list of 10 great karaoke places in Singapore for you to try out, especially if you are on a tight budget. Your wallet will thank you for this. This place goes without saying. Teo Heng has become a household name, and it isn’t surprising why. They offer really cheap rates and provide excellent karaoke services. What we love the most about Teo Heng is their Happy Hour promotion, which makes it even more value for money! This 3-hour package deal is available from Monday to Thursday, with the lowest price being $8/hour for their smallest room (4 pax max). That is a dirt cheap $2 per hour, almost as if you got this deal at Daiso. We advise you to book at least a day in advance because the place is always packed! Address and Opening Hours: check them all out here. Manekineko is still pretty new to the karaoke scene here in Singapore, but they’ve already become incredibly popular, especially with the youngsters. Their outlets are all freshly renovated with really clean and well furnished rooms that are adorned with their famous cat mascot. Our favourite part about this place is the free flow snacks and drinks station where you can refill your plates and cups with goodies while you belt out your favourite song. They also have a massive collection of over 150,000 songs in many different languages that are constantly being updated, so you definitely will be spoilt for choice. They have different prices for different outlets, but their prices range from $12 nett to $27 nett for 2 hours depending on what time you go down. Here’s a sample price list for their Bugis outlet for you to get a feel of the price range. Have sudden strong urges to sing karaoke but none of your friends want to join you? Hit up one of these adorable mini karaoke booths to sing your heart out! 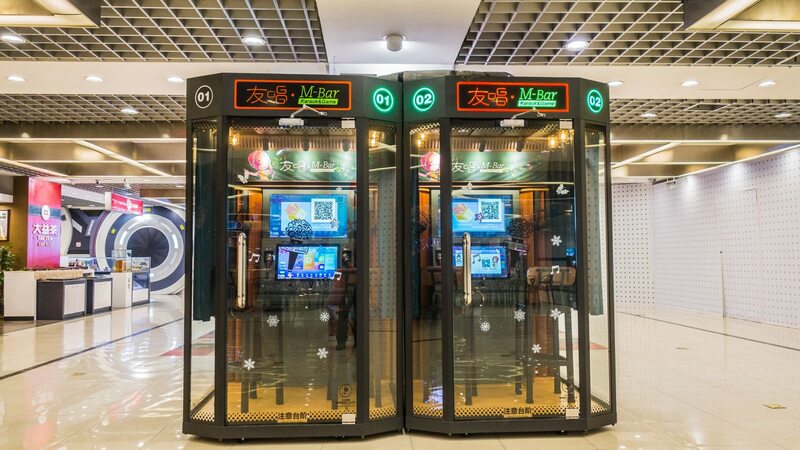 M-bar first became famous in China, where people fell in love with the concept of mini karaoke. I mean, the idea of being huddled up in a small air conditioned booth by yourself where you can sing anything you want without anyone interrupting does sound really appealing! For a small fee (per song or per time slot), you can sing your favourite song, record them and share them on your social media if you want to! Despite originating from China, M-bar provides a large variety of songs of all languages for customers to choose from, so you definitely will be spoiled for choice. Who needs friends when you have one of these booths! In terms of pricing, M-bar charges $3.99 for one song, $6.99 per 15 minutes, $9.90 per 30 mins and $16.99 for one hour. It is a little bit more pricey than going with a group to sing at a normal karaoke lounge, but it is worth the experience! Plus you get all that privacy. M-bar accepts a wide range of payment methods like Apple Pay, EZ link, Nets or credit card, so it’s convenient as well. M-bar booths are slowly popping up around shopping malls in Singapore, with some examples being in Suntec City, Changi Airport as well as Plaza Singapura. This place has been around since I was a kid, and is famous for affordable karaoke sessions. Their large rooms can accommodate up to a whopping 60 people, so it is great for large gatherings and well, to party. I mean it is called Party KTV for a reason. Price: From $12/pax for 2 hours. Addresses and Opening Hours: check them all out here. It isn’t called a ten dollar club for nothing. For just $10 per person, you can enjoy 3 hours of karaoke time at anytime and any day. 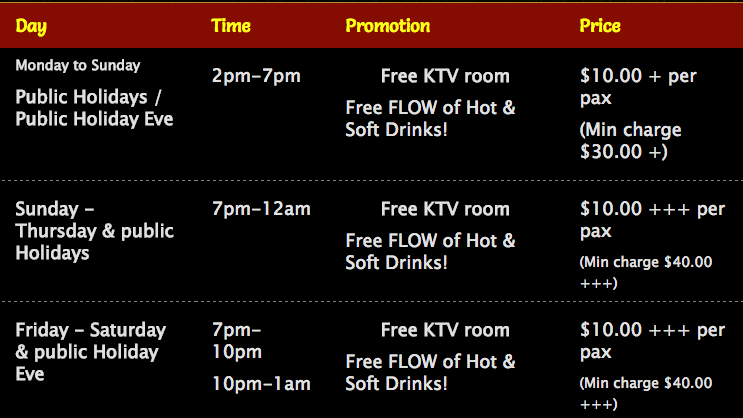 They even have free flow drinks! Who doesn’t love free stuff. Don’t bluff, we know all you Singaporeans out there are cheapskates, it’s in your blood. If you don’t want to get into a fight with your friend over who gets to sing next, you can also challenge a less violent friend to a game of pool for just $2 per game. There’s something here for everyone! What made us really excited was that this place has a minimart! Stock up on snacks here before going into the karaoke room so you can snack while singing. Don’t eat too much though, you wouldn’t want to get a sore throat after that. They also give you a free drink if you book a 2 hour session and an additional snack if you opt for 3 hours. There is a minimum spending per room, with the amount equivalent to cash credits, which you can use to stock up on even more snacks! If you are a massive foodie like us, you can probably foresee yourself spending a lot of time here. For all you NS boys who secretly want to be the next Nathan Hartono instead of serving the country, here is a place where you can escape to on your book out days. This place has a whopping 60,000 songs in 15 languages, so you definitely will be spoiled for choice! The place is open to the public, but our NSF boys can enjoy a special discounted rate. Who says being an NSF has no perks! If you are always stuck in office on weekdays because of OT and you can only sing on weekends then this place is great for you. Their weekend bookings are much cheaper than most places, which is rare since weekend prices tend to be more on the expensive side. Their weekend bookings can go as ridiculously low as $2 per person for an hour! So much value there. The place is also popular because of the great service, which always makes a karaoke session much better! They are also pretty famous for their impressive sound system, which allows you to view all the songs of an artiste by tapping on a button beside his or her name. That makes things much more convenient! This place is probably one of the cheapest places on our list (which is why we saved the best for last), and is a great place for people who can last 6 hours in a karaoke room without getting tired. This place lets you sing for 9 hours for only $10. Crazy isn’t it? We find it hard to believe too. We love how they are also incredibly flexible; you can pause your singing in between to go out for awhile then come back again later to finish up your session. You don’t get this kind of flexibility at many places! They also sell really cheap drinks, or you can also bring in your own non-alcoholic drinks if you like, which is great because most places do not allow outside food and drinks. Don’t let the exterior of the place scare you away. It is located nearby Golden Mile Complex so it is pretty ulu, and the place looks like a pub so it may come off as sleazy. However, it isn’t as bad as you think it is. We advise you to call in advance to book a slot as they are only open from 2pm to 9pm and the place can get pretty packed since its so dirt cheap and worth it! Everyone should be able to have access to cheap karaoke places to release their inner Beyonce, as well as to unwind and relax at the end of a long day with their loved ones. We hope that this list has been helpful and that you get to go for a fun karaoke session real soon! Featured image taken from Erykah Badu Next Lifetime Karaoke Version.